Every year we have a kickoff for the year that helps us to get a range of things ready for the coming year, and yesterday we had our one for 2018. We had a really productive day, full of good humour, great ideas and a lot to get done as a result – but again, it’s a transformative day, where we get to shake things up and everyone gets to provide a input into our operations for the year. This year was particularly special as we got Morgan and Steph across from the east coast (yes, we West Australians think of the rest of Australia as the “east coast”) to participate, and as part of this week they are also here for some other planning sessions, handovers, and an internal technical workshop we’re having this week (more on that in another blog later). The topics covered were deliberately focused on who we are as a company (that “vision” and “mission” stuff, along with the real drivers for why I started Gaia Resources 15 years ago, complete with incriminating photographs. This was then followed with a review of what we went through in 2017 – similar in a way to the wrap-up blog I posted last year, but with an internal focus on what we did on projects, some of our highlights, and particularly with some focus on the review we commissioned of the business with AusIndustry during the year. After that, we did some work on team performance with Andy Cooke from Growth and Profit Solutions who really challenged us in a bunch of ways around how we behave as part of a team. Andy has been working with (and on!) us for a few months and provides an independent review of how we act – and react – in the workplace, and having him around to offer his advice and constructive ways forward as a team has been very valuable. These sorts of sessions can be quite ‘dry’ but we all agreed that it was one of the most useful sessions we’ve seen in this vein across our collective experience, and have taken a lot away from it – there’s always room for improvement! The afternoon was spent working through some directions for 2018, and in doing this we did a review of everyone’s professional development ideas for the year. This was a great way of working through the different ideas that everyone had for the year, and this gave us a collective understanding of what people were interested in, what is coming on the horizon for a range of our initiatives and technologies, and how we can get ready for this – and there were some absolute gems in those ideas that we’ll be running with in the near future. We finished up and headed out to our team event in the evening – something different this year, in that we decided to head to the Mount Lawley Bowls Club for an evening of bowls, barbeque and a beer or two. We had a great evening there decompressing from a really intense day! 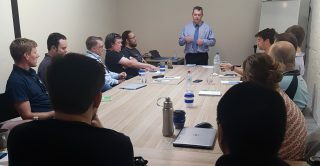 There was a lot to come out of the day, and we’re spending the following few days capitalising on having Morgan and Steph in our Perth office, as well as already doing some of the actions from the strategy day. We’ll be making behind-the scenes changes to our work practices, brand new ideas and concepts will emerge and these will get outlined in the future – and will reference back to this day as when we came up with the idea. * Yes, perhaps I tried too hard to get some Transformers references into this post.